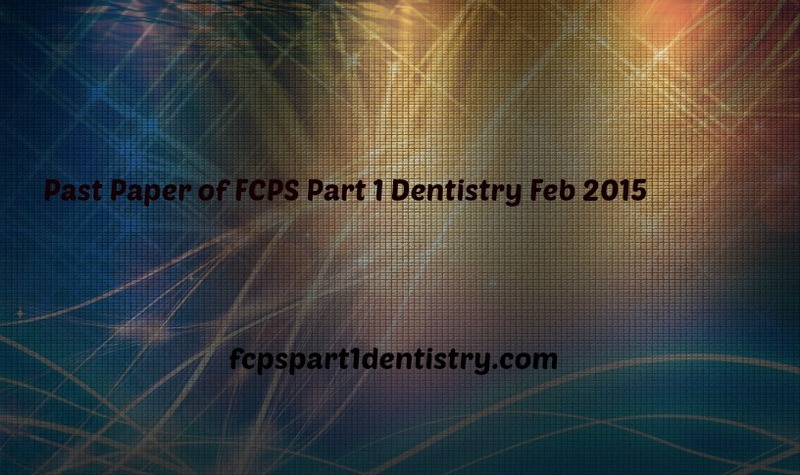 Exam of FCPS Part 1 consists of 200 MCQs. Paper A and Paper B each paper has 100 MCQs. 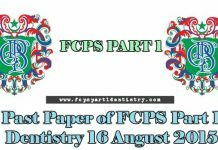 i will share one important thing here, that in each paper of FCPS Part 1 there are repeats of Past Papers. Sometimes few questions come in exam and some times even complete paper comes in exam. In order to perform well in Exam, you have to do MCQs of Past Papers. With out going through Past Papers it will be too much difficult to clear the exam of FCPS Part 1. In our Blog we will be regularly Posting Past Papers so that you people can have good preparation for your exams. Below is the past Paper of FCPS Part 1 Dentistry February 2015. Most numerous cells in brain? A) Fibrous astrocytes (Ans). 11) Neural crest derivative is? 16) Cause of normal PTH in blood is? 17) Fats that are transferred from its storage site to liver and kidneys is in the form of? 18) Teeth present at 11years age? 19) What is true about Iodine? 20) Adherence of plaque to tooth is due to? 21) Acanthosis occurs in which layer? 22) Effect of normal exercise to increase minute ventilation is due to? 23) In exercise, circulation of skeletal muscles is controlled by? 24) True about max sinus is? 25) True about all paranasal sinuses is? 26) Total ATPs produced by complete breakdown of 1 molecule of sugar are? 27) Water content of mature enamel is? 28) Most prominent and similar feature of dentine & bone is? 29) Blood supply to tooth apex starts in which stage? 31) Parotid gland stone causing atrophy due to? 33) Bone that develops by intramembranous and endochondral ossification is ? 34) Joint in mandible is? 35) Most common space involved in the infection of lower 3rd molar is? 36) Patient had accident, now present with memory loss, which area is involved?